Have you, as a genealogist, offered up your most sincere thanks to the members of the United States Congress? But I have indeed offered up my most sincere thanks to the members of the United States Congress. The members of the first United States Congress. The ones that passed the Act of 1 March 1790. 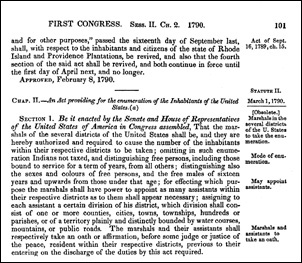 The very first United States census act. But because of that method of apportioning the members of Congress and beginning with the statute of March 1790, we as genealogists can celebrate the census. So go thank the United States Congress. Just though I’d mention the first Congress didn’t have the text noted by footnote 11, since it was added in July of 1868 as part of the 14th Amendment. I always thought the “3/5 clause” was part of the 14th. My bad. Exactly: not what we wish they were but better than nothing! Sadly, I understand that the 1790 census records for the states of Virginia, Georgia, Delaware, Kentucky, New Jersey, and Tennessee were destroyed when the British burned the Capitol in Washington during the War of 1812. Unclear if the 1800, 1810 records were also destroyed for those states. Exactly how various census returns were destroyed may need serious research, but that there are some missing is beyond question. New Jersey, for example, doesn’t have any existing returns before 1830 except for a few sheets of the manufacturers’ census of 1820. It is certainly unclear how so many 1790 census records came to be lost, but I recall being taught that the original schedules were not in Washington, DC at the time of the British “visit” but were instead at the various federal courthouses, where they had been deposited by the marshals when the enumeration was finished. All that Congress had cared about were the summary statistics, so they would have had little reason to have wanted the raw data. Of course, it is entirely possible that the courthouses had tossed out the original schedules years before 1814. It seems to me that a federal court clerk needing space is the most likely explanation for why NJ has no pre-1830 schedules. I can only go with what the US Census Bureau says, Chad, and it says: “A complete set of the schedules for each state, with a summary for the counties, and in many cases for towns, was filed in the State Department, but unfortunately they are not now complete, the returns for the states of Delaware, Georgia, Kentucky, New Jersey, Tennessee, and Virginia having been destroyed when the British burned the Capitol at Washington during the War of 1812.” Bureau of the Census, Heads of Families at the First Census of the United States Taken in the Year 1790 … Virginia (Washington, D.C. : GPO, 1908), 3 (emphasis added).